Well can you believe it? Thanksgiving has come and gone and now Christmas is right around the corner. I think this is the perfect time to talk about keeping our pets warm and comfortable during the winter months. It's amazing how quickly the weather can change. I was walking Murphy and Lucy the other morning and could not believe how cold it was. It just seems like yesterday when I could take off for our morning jog in running shorts and a tank top. Now, it's time for sweats, a beanie and gloves. I know that everyone who reads this blog may be living in various places around the world. Therefore, the temperature varies greatly. As pet owners, it is important to keep our pets in mind when it comes to protection against weather elements. Because we are heading into winter, we must think about the environment in which your pets live. If your dog is strictly an outside pet, you have to make sure he or she has a shelter to protect him from the cold weather. Because Lucy and Murphy spend most of their day outdoors, we went ahead and built them a wonderful cozy bed that they can lay in that sits under an overhang. 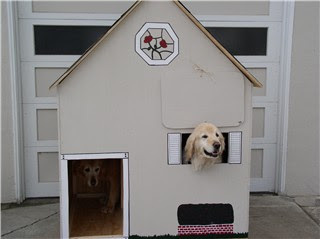 This way, if it rains during the day, they can sit on their beds and stay totally dry. While I am at work, it buys me piece of mind knowing that they are nice and dry. If you are in need of bedding, visit PetSmart, Petco or any of the pet shops listed on BarleysList to find pet bedding and other supplies. BarleysList also offers businesses that feature portable pet shelters, fencing etc., for creating living quarters for your pet.